As I’ve written before, Chicago Hyatt workers have been negotiating for a fair contract with Hyatt for more than two years now. Sadly, Hyatt has refused to budge on crucial demands to curb subcontracting and ease working conditions for housekeepers—demands met by Hilton and other hotel employers citywide. In response, Hyatt workers have stood up and made tough sacrifices by striking and calling for hotel boycotts. 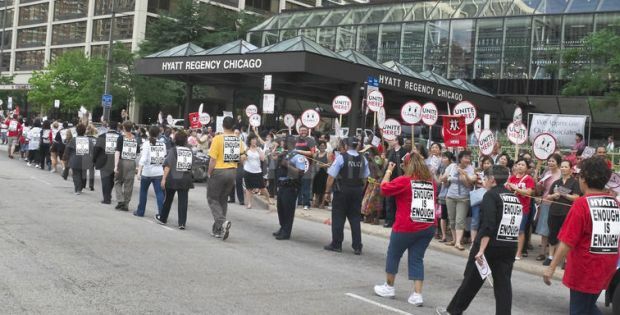 I’m now appalled to learn that Hyatt is currently threatening to strip health insurance from 1500 Chicago workers and their families unless they give up their fight and abandon their boycotts. In so doing, Hyatt is forcing workers to choose between their families’ immediate medical needs and a fight for their long-term survival. Please join me in sending a message to Hyatt’s CEO Mark Hoplamazian to maintain Hyatt workers’ health insurance until they win a just settlement. Click here to sign the petition and please send it on. This entry was posted in Human Rights, Labor Justice, Unions on December 5, 2011 by Rabbi Brant Rosen. Is there anyone putting pressure on the Pritzker family who own the Hyatt? With as many rabbis in support of the workers, is there any way to organize a rabbinic delegation to meet with the family and if they refuse to organize an action at their offices or homes? I notice that at least one of the Pritzker grandchildren is a political activist. Maybe she is someone who would want to help. blackmailing wokers with loss of care for themselves and their families is an old tool used to beak the backs of workers.despicable.what does one do.